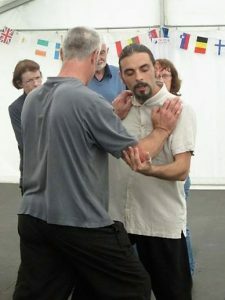 Tai Chi Caledonia offers a range of options for attending, making it accessible to all, from beginner to adept. You can join us for a day, weekend, whole or part week basis, residential or non-residential. Our programme starts on Saturday morning at 9.00 with a brief introductory meeting in lecture room A3 of the Cotterell Building. Details of how to get there will be available in the chalets although I am sure that your fellow participants will be happy to take you there. 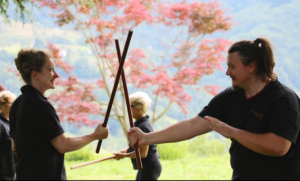 The weekend sessions include choices of 48 x 45 minute sessions allowing you to get a taste of a variety of approaches to tai chi & Chinese internal arts. We have grades these choices progressively from A – D, A being qigong and a softer approach, progressing all the way through to martial applications in section D.
For details click the “2018 Weekend Sessions” tab in the drop down list under the Programme 2018 menu above. From Monday – Thursday you will train 21/2 hours each morning and afternoon, over the four days allowing 10 hours intensive training, each morning and afternoon, working on 2 separate disciplines (1 each from A and B) for 5 hours per day in total. For details click the “2018 Week-long Sessions” tab in the drop down list under the Programme 2018 menu above. 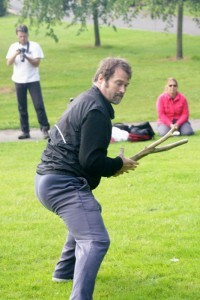 Tai Chi Caledonia will not be hosting the European Baguazhang Forum this year. However, there will be a Baguazhang session each morning from 7.30 – 9.30, starting on Sunday. These will be led by Sergio Utto and Simona Longeri. There will be qigong sessions from 8.30 – 9.30 each morning starting on Sunday. These will be led by a different teacher each day. After dinner on every night (except Wednesday – Ceilidh night!) there will be non-competitive push hands. There will be a separate area for beginners to receive instruction for a short time at the start of each session. This will feature a different teacher each night, as we all have different approaches and emphases to this practice. As the event takes place in the heart of Scotland, in the shadow of the monument to William Wallace, we will also experience some Scottish culture. By popular demand we will again have the famous Cally Ceilidh on the Wednesday night. 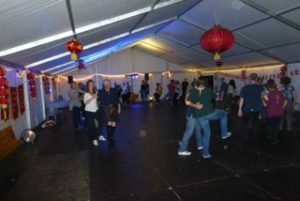 Our ceilidh band, Copper Ceilidh has a caller, who will talk you through the steps, so even the inexperienced can enjoy the fun. The less energetic of you can still have fun watching and enjoying the music! Please check for updates to our published programme. To be kept updated with additions or changes to our program, either like us on Facebook or bookmark our site.